Memorial Day is fast approaching. Many of us are looking forward to the official beginning of summer and the first three-day weekend off in a while. But how many of us really stop to think about why or how we are able to enjoy our time off and do pretty much whatever we like and go wherever we please within this great country? For those who are serving or who have served in the military in the past, there is a distinct understanding and appreciation for all who’ve served before them, especially those who gave the ultimate sacrifice; their lives for our freedom. 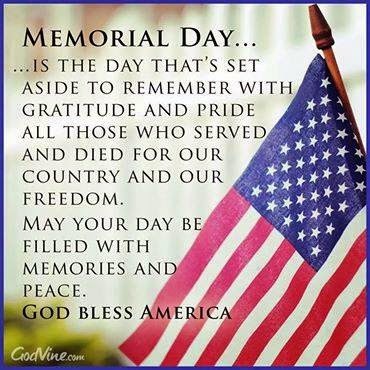 For those of us who have never served, but are the children of those who have, we have a responsibility to remind our children and grandchildren as well as others what this day is truly about. Whether you visit the grave site of a departed veteran, or a war memorial, or museum this Memorial Day, remember; This would not be possible if we as a country had laid idly by and allowed those who sought to oppress our freedoms to do so. Never is war easy. Never is war neat and organized. Never is war the answer to end all future wars. Sometimes there is no other way to prevent someone from taking that which isn’t theirs to take. It is at times like these that we must fight, first in passionate words in the hope our adversary will find mutual grounds on which to agree. But if words fail to find their mark or we are hit with an unexpected attack such as Pearl Harbor, or more recently The World Trade Center, what message would it send the Free world had we done nothing. We have been titled the Greatest Nation in the Free World by those whose countries our brave Service Men and Women fought to free from Dictators and Communist rule. We don’t shy away from the fight. We don’t want it and we don’t promote it. If the alternative means giving up the freedoms that our fathers and fore fathers fought to have, hold and endure; our brave service members will always do what they are called to do. Too many US military members serving in nearly every country in the world, have given their lives that we may have the freedoms we do today. The very least we can do for them this Memorial Day is remember with great honor those who have gone before us whether they passed in battle or not, so we may continue to enjoy the freedom to pursue Life in all the ways we can, Liberty to choose our direction, and the pursuit of Happiness in whatever ways we might.